“Beware the ides of March,” goes the famous admonition. Thankfully, Jim Peterik, Larry Millas, Bob Bergland and Mike Borch didn’t heed the warning. Formed in Berwyn, Illinois in 1965 as the Shon-Dels, The Ides of March are still going strong 50 years later with their brassy blend of good-time rock and roll, R&B, pop and soul epitomized on the 1970 hit single “Vehicle.” These rock and roll survivors and local legends around the Chicago scene have recently assembled a definitive box set tracing their career from the spring of 1965 to the present day. The aptly-titled Last Band Standing, released on the group’s own Ides of March Records label, features four CDs and one DVD in a numbered, 500-unit limited edition slipcase signed by the band members. 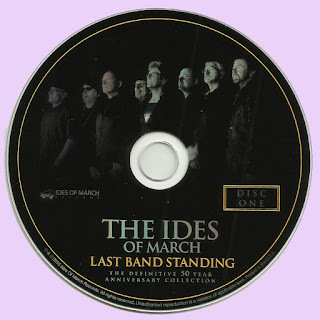 This set packs a powerful punch, and should let everybody else in on the secret that Chicago’s known for years: that The Ides of March is one hell of a great band! From their early days playing sock hops and clubs around Chicago, Peterik (lead vocals/lead guitar), Millas (keyboards/guitar/bass/vocals), Borch (drums/percussion/vocals) and Bergland (bass/saxophone/vocals) developed the Ides’ sound from roots in Hollies and Kinks-inspired white R&B. During the crucial years leading to the group’s major-label signing with Warner Bros., Peterik was finding his own voice as a songwriter, too, honed from years of performing covers of songs by James Brown, The Beatles, Sam the Sham and the Pharaohs, and later, Traffic and the Buffalo Springfield. The second disc features selections from the Vehicle album (recently reissued on CD by Real Gone Music), its follow-up, 1971’s Common Bond, and related Warner Bros. singles. The song destined to become the Ides of March’s calling card, “Vehicle” itself gets two airings – once in its album version and once in its mono single mix. With crack support from Millas’ organ, Borch’s drums, and the three horns, Peterik channeled Blood, Sweat and Tears’ David Clayton-Thomas on “Vehicle,” tearing into its over-the-top, erotically-charged lyrics and earning the Ides a No. 2 smash on the pop chart. In addition to album cuts like the beautiful, Neil Diamond-meets-The-Righteous-Brothers ballad “Home” and the psychedelic jam “Symphony for Eleanor (Eleanor Rigby),” this disc is peppered with other rare tracks including the band’s reverent, harmony-filled rendition of “The Star-Spangled Banner,” a Pepsi commercial set to “Vehicle,” and the previously unreleased “Reunion,” a hard-driving rock track sans brass that pointed the way for the next phase of the band’s stylistic evolution. Live tracks spanning 1972 to 2008 round out this disc. This lengthy period spans both the original group’s breakup (in November 1973) and their reunion (in 1990). Highlights include a ten-minute take on The Lovin’ Spoonful’s “Summer in the City” recalling the likes of ‘Symphony for Eleanor,” as well as the buoyant, brash “Gotta Share This Feeling” from a 1972 date at Michigan Tech which recalls the best of early Chicago. (How was this hit single-in-the-making not recorded in the studio?) 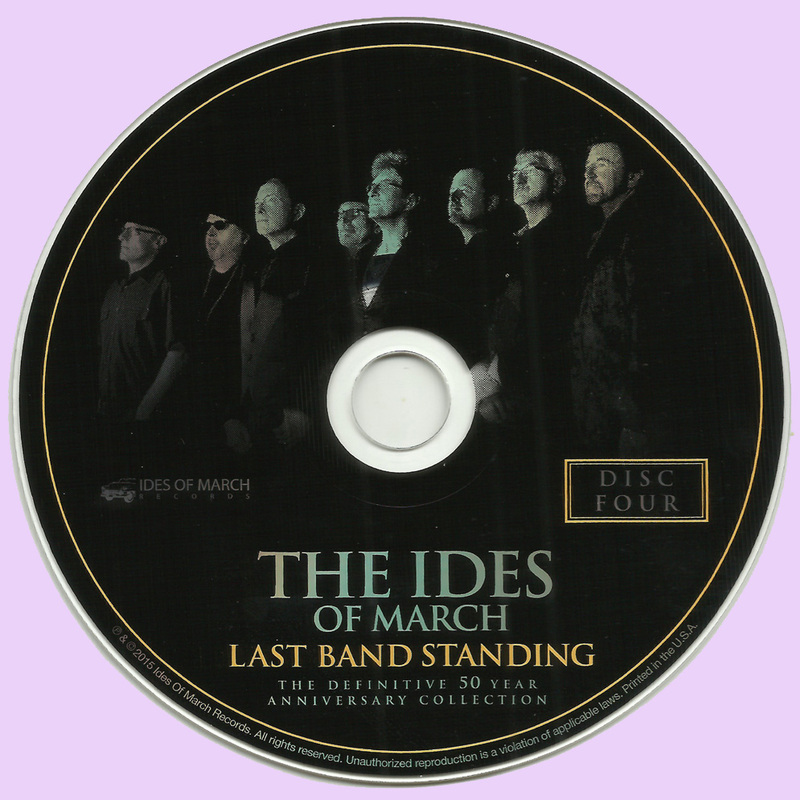 This disc also has one of the Ides’ career highlights with “Finally Next Year,” the song released in summer 1999 to commemorate the Chicago Cubs’ season and included on a Cubs CD sold at the ballpark. 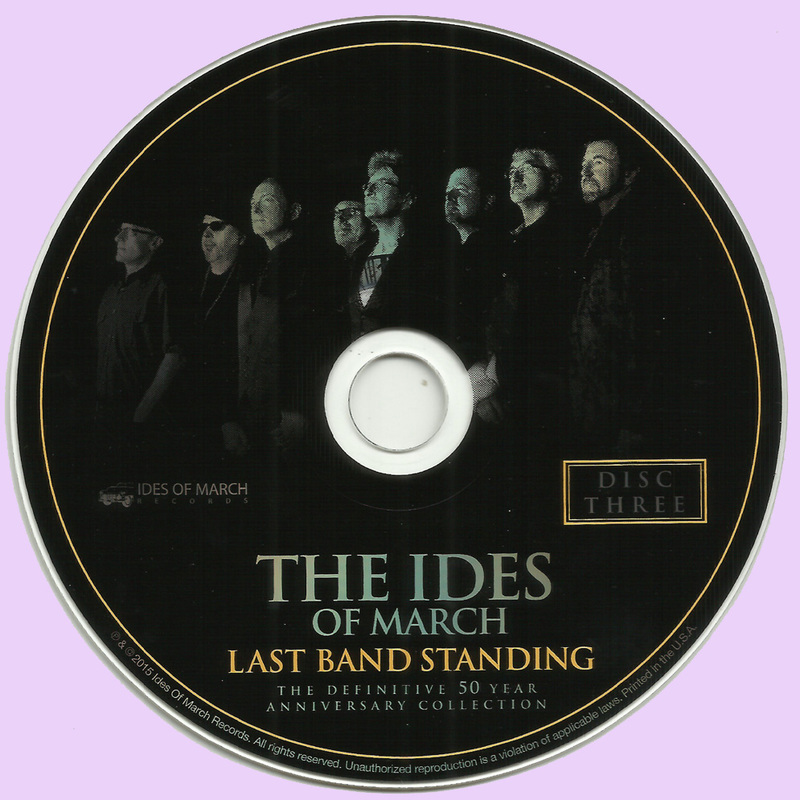 The fourth and final CD in the set brings the Ides of March’s story up to date, with tracks recorded between 1997 and 2010 and primarily released on the band’s own, independent label. 1991’s “Spirit of Chicago,” like the other tracks from 1991’s Ideology, bridges the sonic gap between The Ides of March and Survivor. The anthemic power ballad even features Peterik’s Survivor collaborator and sparring partner, Frankie Sullivan, as well as Cheap Trick’s Rick Nielsen. The cheeky “One Hit Wonder,” from 2000, taps into the Ides’ own history with “Vehicle” and pays tribute to the band’s one-hit wonder brethren, wrapping the fun, nostalgic trip in an “Oh, Pretty Woman” riff. There’s more musical autobiography on the 2010 track “Still Nineteen.” Peterik and Millas even play Lennon and McCartney as they return to the Beatles songbook with a 2010 recording of “A Day in the Life.” A DVD wraps the Ides’ story up (for now!) with a live concert recorded at Chicago’s House of Blues on May 31, 2014. 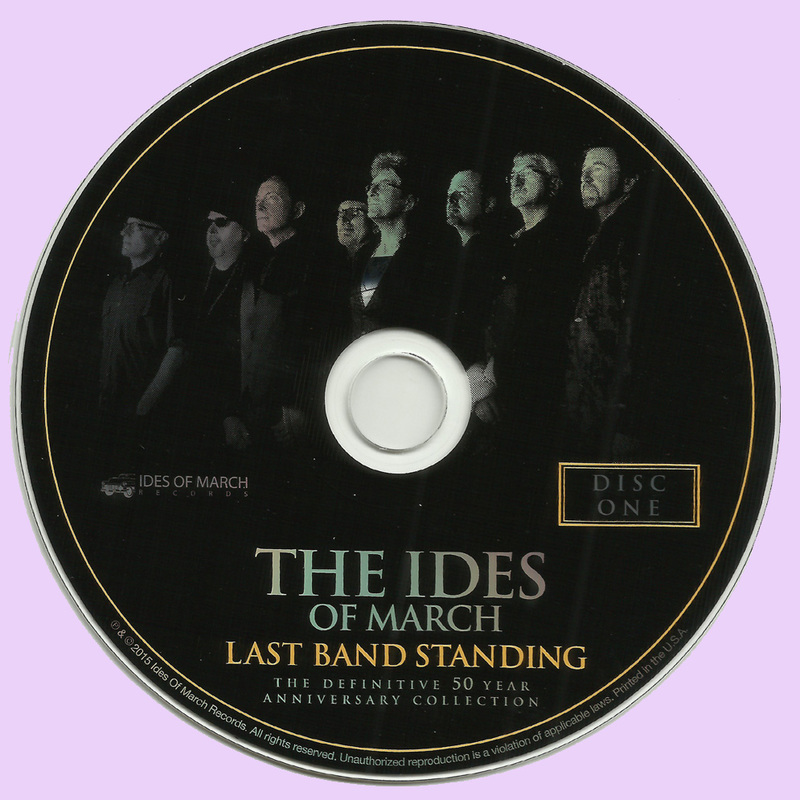 This program includes the Ides’ rendition of Peterik’s Survivor hits “Eye of the Tiger” and “The Search is Over” and “Caught Up in You” and “Hold On Loosely,” both of which he wrote for 38 Special. Bonus features include a music video for “Last Band Standing,” a From the Vaults segment with archival footage dating back to the band’s early days, and a performance of “Vehicle” with Buddy Guy. 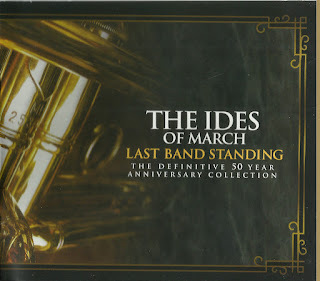 Last Band Standing is accompanied by a booklet featuring notes from the current Ides lineup of Peterik, Millas, Borch, Bergland, Scott May, Dave Stahlberg, Tim Bales and Steve Eisen. 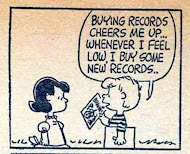 Photographs, credits and a discography are also provided. Larry Millas has remastered each track on these four CDs which are housed in jewel cases within the autographed slipcase. In addition, the booklet notes that a portion of the proceeds from the set will go to the Ides of March Scholarship Fund. For a longtime fan of the Ides of March (or Survivor, for that matter!) or an Ides newbie, Last Band Standing is a vibrant, nostalgic and captivating audiovisual journey with a band that’s far more than just “Vehicle.” It makes a perfect companion, too, to Jim Peterik’s new album Risk Everything, a collaboration with Marc Scherer. As for his partnership with Larry Millas, it’s alive and well, too. The pair co-wrote “Sail Away” on Brian Wilson’s new No Pier Pressure. One of that album’s standout tracks, it features both Al Jardine and Blondie Chaplin. The Ides of March may be the last band standing, but it sure looks like they’ll be standing and rocking with their positive and upbeat brand of rock and roll for more years to come.